Want a good argument for installing central air conditioning in highrise apartment buildings? 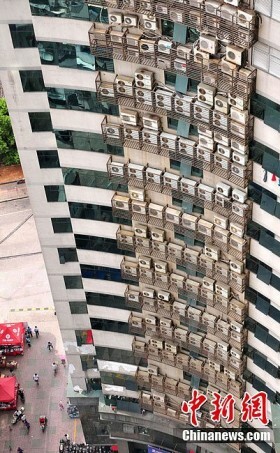 I humbly submit to you the so-called “Most Awesome Wall of Air Conditioners” in the Chinese city of Fuzhou. It's the Fuzhou Dalijiacheng Building to be exact, a 25-story office tower whose sweltering tenants spend their days shooting the breeze with the help of roughly 500 window AC units. Yes, 500 air conditioners. What's an AC unit weigh, about 50 pounds? Doing some quick math, we can estimate the building's outer walls now carry an additional 25,000 pounds of weight. I'll bet that little fact wasn't mentioned in the blueprints. But wait a sec, these images only show one side of the building. Could there be another 500 air conditioners (weighing another 25,000 lbs) hanging off the opposite side?? It might be better if there were: the Leaning Tower of Pisa is a nice place to visit but you wouldn't want to live (or work) there. There are other considerations worth considering. Window AC units wring water from the atmosphere on moist days; the excess liquid then overflows their catch pans and drips off to... well, to whatever's on the ground beneath. In the case of the Fuzhou Dalijiacheng Building, that would be a swimming pool – planned or not. Then there's the question of power consumption. Imagine the building's office workers arriving at 9am sharp and flicking on a few hundred of the AC units in unison... uh huh. The electric room had better stock a few extra million-amp fuses. 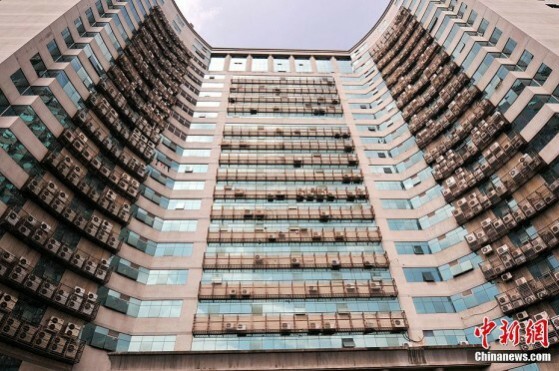 What can we learn from Fuzhou's mighty Wall of Air Conditioners? Could it be that Chinese air conditioners are really cheap, thus encouraging buyers to purchase multiple units where one would normally suffice? Maybe Fuzhou is insufferably hot & humid, all year round? Whitehouse Sells Healthcare Reform To The Twitterverse And Beyond! Crazy. I wonder, how much electricity is spent only in the AC units from this building? Imagine the huge electricity bill they have to pay... What a shame for a country like China. Still it is better than dying from hot all day, all year round. I think.